Man, I love this expansion already. Here’s hoping Blizzard can keep this up the whole time. QFTQ! 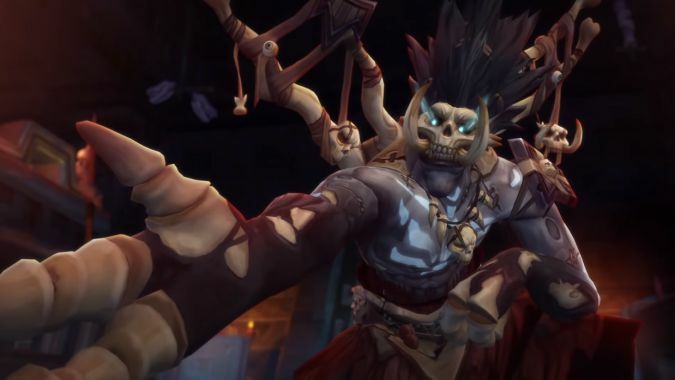 Did I miss the story/quest/cinematic that shows how the Alliance came to have Zul and the Zandalari Princes in jail? Seems like kind of a big deal. No, you did not (unless I also somehow missed this). It would be nice to see how/when/why the Alliance decided to capture them, because that seems unusually aggressive for the Alliance. I mean, I get why they’d want to capture Zul — but capturing the Princess of the Zandalari feels like a move that would piss off a bunch of Trolls in the middle of a war that they were already losing (before Jaina came along to save everyone’s asses). I don’t expect we’ll see anything on the matter, however, so the best I have to offer is, “The Alliance captured Zul at some point in the past because he’s a bad guy and they had the opportunity. Talanji probably just happened to be with him.” Also, given the events of the expansion, I wouldn’t be surprised if Zul probably planned for their capture and put them on a direct course to the Stockades. Q4tMitch: when will K’thir be an allied race? Why does kitty Druid hit so softly now? What are the differences between Mitchcraft and Witchcraft? In order: They are always your allies if you know where to look, SPencer. Because kitty Druids is for cuddles. Mitchcraft mandates daily naps to recharge your Mitchcraftery. There is no number that can define him. He’s that great. Should the battle of Theramore where Daelin Proudmoore is killed be a Caverns of Time instance? I would absolutely love more Caverns of Time stuff! That said, part of why I like Caverns of time is because it (theoretically) allows us to explore portions of the world as they were. While I do think Daelin’s death would make a great scenario or questline, I’d prefer Caverns of Time being used for areas that look significantly different now than whenever the instance of choice takes place. Like, I’d totally play through a Caverns of Time instance that took place in Netherstorm of Vol’dun — both of those places were apparently once lush and full of life. Now? Totally different. Large sections of several zones are “wasted space” as there is nothing there. I’m talking about huge chunks of Zuldalar and Tiragarde Sound which are just giant impassable mountains with nothing on them. Heck, the Tiragarde map includes the entirety of Drustvar because Tiragarde is L-shaped. And all the Horde zones feel like giant, empty wastelands because I had basically no quests to do in them. Just huge swaths of land I have to traverse to get to the next world quest. It was an interesting experiment, but I would say a failed one. I expect we’ll be back to one set of maps for both factions come the next xpac. I gotta say, I disagree here. While it does occasionally feel odd to go out of your way only to find no quests or anything of note, it still makes the world feel more real. It gives you a reason to just… explore! I also can’t say I’ve run into the issue of not finding quests easily. Seems like it’s hard not to find quests, to be honest. All that said, the large, three-zone approach is something new and it’s not for everyone. I personally like it, but it’s totally cool if you don’t! I don’t use Twitter much, so I don’t know if this is an obvious question, how come some people have a button to message them directly, and some don’t? If they don’t have that button, is there no way to send them a direct, private message? I realize people answered, but I’m gonna answer anyhow. A little while back, Twitter made it so you could “open” your DMs (direct messages) to anyone, if you so choose. Most people — especially ones with a lot of followers — don’t do this because it’s very easy to lead to spam and garbage. I opened mine a while back for, uhh… I think it was a giveaway I was doing? I don’t remember. And then I just never closed them because I don’t actually get spammed that much. If I do, I’ll close them. I imagine Rossi doesn’t want to deal with this, so he just has them closed (and I can’t blame him). The other option is to both be following one another. If you do that, you can DM each other freely. With all of the QoL improvements that have been made to this game, why is Beast Lore still a thing? Because Blizzard has already taken away Eyes of the Beast and Sentry Totem and don’t you dare let them take away anything else that’s flavorful fun! Tortollan… with the caveats that I wish there were more of them and also that the Beachhead WQs are so freaking stressful because I don’t want baby turtles to die. That’s The Queue for today. May your Loa bless you a long and plentiful reign.